Around 7 p.m. on Monday night, dozens of heavily armed settlers trespassed on farmers land, setting fire to the wheat crop and attacking a home in Asira al Qibliya. 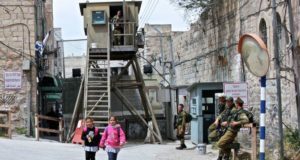 Settlers fired high-caliber weapons into a family’s home where 4 children live the youngest one only a year and a half old. 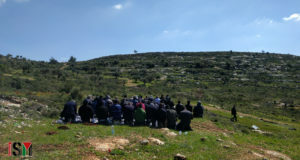 Internationals and Palestinians sit around the house after the attacks passing around the high-caliber casings from the weapons used by the settlers earlier in the evening. “Made in the USA” one local said. 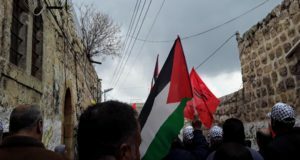 Israeli soldiers responded to the event around 8:30, shooting tear gas into the family’s home after the settlers retreated. 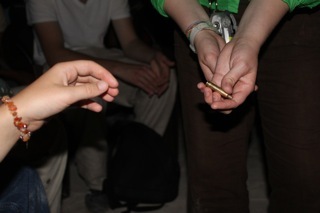 Rubber coated steel bullets where fired and some soldiers threw a sound bomb. Palestians and internationals gathered at the house for the rest of the evening. 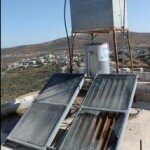 In the morning the women who lives in the house discovered that the settlers had also shot out the family’s water tank and thrown rocks on the solar water heater. 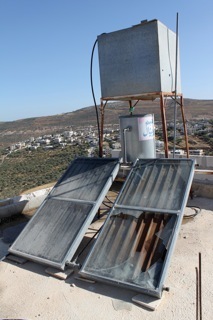 Asira al Qibliya, south -west of Nablus with settlements above the village.